I am not a normal person (hahah). When I use my computer, I want to be around people. If Hiromi is in the living room, I want to hang out with her while I code or do whatever. But that often means sitting on the couch with my laptop. We have a pretty nice couch - nothing too fancy, but it is comfortable and good for sitting. But it makes you slouch. Which in turn makes my posture while using the computer very very bad. Which in turn makes me cry out in pain every hour and forty minutes. Which in turn makes Hiromi uneasy (just kidding. I don’t cry out. but I probably do complain). Anyway. Because of this couch sitting, I have been increasingly concerned about how my time at the computer is hurting me. I want to be able to sit comfortably for long stretches, but I also want to be able to hang out. And obviously the couch wasn’t working for me. So I needed a chair. I had a ghetto IKEA chair from my previous office/bedroom. But it is not great for long stretches. I end up having the same problem as the couch. So I decided to spend some money and get a new chair. I researched and it seemed that the Mirra was a good choice. What swung it for me - besides all the glowing reviews, was that it is something like 95% recycled parts. Awesome! 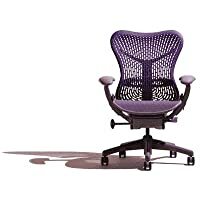 I went ahead and ordered a Mirra from officedesigns.com on Wednesday. It arrived at skinnyCorp on Thursday. hah. So far it is very comfortable. I am still tweaking it. All my friends who use Mirras or Aerons have mentioned to me the importance of getting everything configured correctly. So i am taking my time. I now need one of those ghetto mini desks you see in the Sky Mall so I can hang out with Hiromi while being very comfortable in my new chair. I am sure it will be happy for her as I will not be screaming as often. I guess I should qualify that - I won’t be screaming in pain as often.